I'm a little confused as to how you're supposed to earn some of these "achievements"
Not sure whether it really matters, but still seems odd, in case anyone was interested in glitches..
also I have rated a map, tho it shows as an unearned achievement.. also, what's the difference between a cooperative game and a team game? If one involves winning against AI, then i've done that too..
ps, did they stop giving out the free 100 coins? Send a bug report: https://www.warzone.com/reportbug. Maybe you missed the "Statistics on this page can be up to 30 minutes out of date" at the button of your profile page. If you go to https://www.warzone.com/Points you should see anything that just gave you points. "ps, did they stop giving out the free 100 coins?" Yes, the feature was being abused (as some made many accounts). Ah, now that is a bug. They should not be in the list of unearned achievements after you earn them. 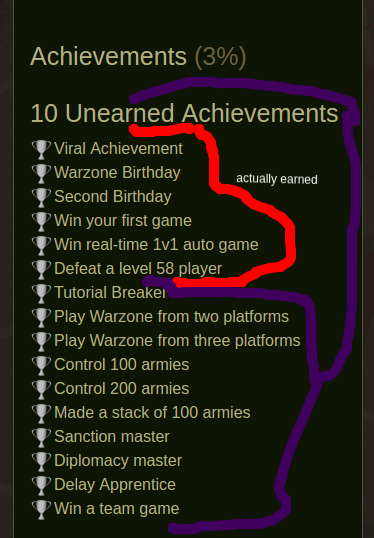 But at least they show up for you on your profile page https://www.warzone.com/Profile?p=4889792577 so you have the achievement for sure. You can go ahead and fill in that form Dan linked. Can you link the games where you achieved them? how can i search for those old games? "EDIT: The list of 10 unearned is "private" in the sense that I can't see your list. Only the achievements that you have earned. Hence I know you have them :P Not sure how often the unearned achievements is updated, but should be instant (i think) "
In play (or multi player in the flash version) then "past games" gives you access to your previous games. In the settings of each game you can find a link to share. If the games don't pop up in your past games menu they weren't multiplayer games. All achievements can only be gained in ranked multiplayer games unless stated otherwise. One thing I've noticed is that even old achievements (earned years ago, literally years ago) didn't pop up as notifications until I got into a game (in the Flash window). I don't know if those achievements showed up as Unearned before then but it might be possible that achievement-checking is only done when you've got an active game window. E.g., this account is old but I didn't use it much- so when I logged into it again after a long while and played an auto-game, I got notified that I'd earned the Warlight Birthday/Second Birthday achievements. EDIT: Looks like there's a UI bug at play. If you check my profile, it has the heading of "10 Unearned Achievements" over 6 achievements I've earned (and that the system has marked as earned) + 10 achievements I haven't. Looks like the unearned achievements header is just in the wrong place? ^Yep, that is wrong. For me they are correctly placed. Might be a function of having too few earned achievements. lol what are you calling me unaccomplished? Looks like this problem has been fixed.. profile looks right now. well, just so ya know, i did send a report to Fizzer and he said he's on it. I'm sure these guys have a lot going on atm with the new release..